Biola Alabi is the founder and CEO of Biola Alabi Media Consulting; an organization that speacialises in providing broadcast, telecommunication and digital messages to its clientele. Prior to starting her own company, Biola served as the Managing Director of MNET to produce and air stories for Africans; and she was listed by Forbes Africa as one of the 20 youngest Power women in Africa. Biola shares with MYOB her journey as an entrepreneur and how she evolved to become a successful business mogul! For all aspiring media enthusiasts out there, you do not want to miss Biola’s story. 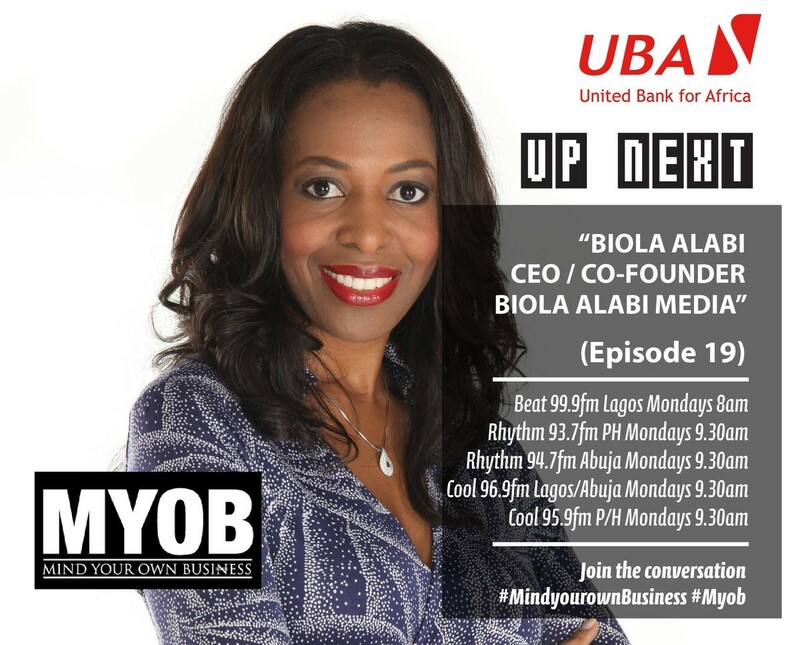 Sit back and relax as we take you a journey with one of Africa’s biggest media experts Biola Alabi. Biola: I didn’t start off as an entrepreneur, I started off always wanting to work at a company, which was what I did and did really well. I worked at some really amazing companies and internet startups at the beginning of my career; with most of them being in media. I also worked for the Korean car company Daewoo. With media, the way it started was that I worked on a lot of marketing campaigns which always had media elements so I craved the TVCs. I didn’t see media as a day to day job but I ended up working for a very big media company called Sesame street with multiple productions and merchandising outlets. They had presence in over 15 countries. One thing I was able to pick up was the power of media and how media can change the world. Initially, I saw media as entertaining and it wasn’t something I thought had the impact to change the world. Immediately I started working at Sesame Street, I started to see the creative process very differently. I started to see stories very differently and really started to see how you build characters very differently. Not only from children education media perspective; but really in the best stories, the best movies, what do they do, how do it and how the best characters get under your skin. Sometimes, you go a movie and you can’t shake what you’ve just seen. Those are the things that got me really interested in media and into the art of creating stories, and how to make that commercially viable. Once I started getting into that I realized it’s like a google rabbit hole that once you start you can’t stop and there are so many ways to go with that. Was it a case of just finding yourself into something you loved or what you could do very well? I think it’s a bit of both but also finding out a lot of things I was bad at. There were a lot of jobs I was bad at even though I was very passionate about them. I started out as a pre-med major and I switched to pharmacy. I did an internship with a pharmacy and there was something I kept on asking the pharmacist… “so like what else do we do here” and they were like this is all the action you get. I thought this is probably not for me” so I was sitting and thinking about what I wanted to do. I then switched my major to public health I really wanted to work on health messages but what was really interesting in public health was that you had to take marketing and media classes as these were all tools to aid you in public health. When I took the marketing class, I thought this is fantastic and then I went on to minor in marketing. I took my first job at what they called a “mum centre” which is a very high, new age centre for deliveries. It was under construction and they wanted a public health expert and I went into marketing so that was my first job. Many years after working in different corporations and helping build amazing businesses I am very proud of, I decided I wanted to start looking at other opportunities. I wanted to start creating stories that weren’t told. I really respect target, focus and the need to connect with the audience and zone in on them. One of the thigs I wanted to do was tell a different narrative and so I started my own company and do some consulting work. with my company, we create and originate new African stories and work with clientele all over the world consulting for them on different media initiatives, creating content on how to commercialise what has been created. berikan 4 angka ((( 7 5 6 6 ))) alhamdulillah ternyata itu benar2 tembus AKI. Small business branding is particularly important in gaining and maintaining customers. Marino Sussich have a lot of experience in business.